Mike Hayes is Elementum's trusted web developer. Over the next couple of months we'll be following him as he journeys by bicycle in the Peruvian Andes. Waiting in Lima for the 17-hour overnight bus journey south to Arequipa, I mentioned to a backpacker that I really wasn’t looking forward to the next few hours. ‘Oh I love bus journeys,’ he replied, ‘you get to see stuff.’ He then asked me, ‘Isn’t it a bit hard travelling by bicycle – why are you doing it?’. I travel by bike because I can smell, taste and feel the land through which I’m passing. Travelling slowly through all the funny little places in between, not isolated behind a pane of glass, as a participant rather than observer, I’m more accessible to the folk I meet along the way. I feel as if my bicycle connects me to the planet and its people. Travel by bike and you soon realise that despite what the media might tell us (and what our own fears would have us believe), the world is full of ordinary people, just like you and me, trying to make their way in life; doing the best they can by themselves, their families and communities. At airports, when folk see me with a bike, they ask about the risk. Aside from being an object of some curiosity, I find that travelling in leaner countries without jeep or driver, means that most people I meet presume that I’m less well off than the average Westerner. I’m welcomed and often looked after as an equal and a guest. I’ve also noticed that it’s only in the West, in our more goal-oriented society, or by westerners abroad, that I’m asked why I’m travelling by bike. I must be raising money for charity or pursuing some other tangible goal; after some degree of celebrity perhaps. What I’ve found is that in the Islamic countries I’ve travelled (including Morocco, Pakistan, Indonesia, Malaysia, Turkey) I’m never asked why I cycle. Perhaps with the tradition of the hajj, there is an understanding of the intrinsic value of making a journey. Riding my bike in these countries I have found a greater sense of belonging and shared identity in the world, even more so than when I’m at home. And this is why I’ve chosen to hit the road again, back to Peru, and a journey heading in a northerly direction through the high Andes. My journey is defined more by time than distance – it could be as much as 2500km over the 11 weeks I have available. I’m travelling almost exclusively on dirt tracks at high altitude so it can be difficult to make more than 70-80km a day. Travelling by bike I’m also subject to weather, fatigue and mechanical problems. Sometimes a simple desire to spend time in a place means I don’t travel as far in one week as another. I have found that in travelling this way, when I make time for a place, that a place and its people will make time for me. It’s been the same the whole world over – I meet people and make connections that can take my journey in unexpected directions. Just this morning I enjoyed a conversation with a local man I met in the street. It turned out he was the father of a young woman who worked in the pension where I stayed in Arequipa. Now I have an open invitation to visit and stay with the family. Such encounters invariably add to the richness of my journey and perhaps explain why I don't plan in great detail. I’m writing this in the small highland town of Chivay in the upper reaches of the Colca Canyon. I cycled through this part of the world seven years ago as part of a much longer journey along the spine of Andes, and had wanted to come back ever since with a view to exploring the network of dirt trails that criss-cross this part of South America. My start point this time was Arequipa, a beautiful colonial town in the south of Peru nestled below the slopes of the El Misti volcano, and from there began the long climb up through the rarefied air and barren puna of the high Andes – a hard two days on rough track to around 4500m in altitude. These climbs are always worth the effort however, not just for the views but for observing the fascinating transitions in climate and landscape. In Colombia, deep, lush, tropical valley bottoms are left behind for the barren, ice-cold passes, and in the Himalayas, Hindu lowlands of India lead to the high-mountain Buddhist culture of Tibet. Cycling, my pace means that I can appreciate the subtle changes but also the transitions. Perhaps these experiences are what draw those like me back to these arduous and remote places. Purely by chance, another cyclist I met as a consequence of riding through the remote trans-Himalayan passes of Ladakh fourteen years ago happened to be flying into Peru for a few weeks riding. It’s been a great opportunity to catch up and to enjoy some banter as we made our way skywards from Arequipa. At 3600m, Chivay has been an unexpected stop due to catching a chest bug. Once recovered, from here I will climb back up to the high puna on a track that will eventually take me to the remote Cotohuasi Canyon some 400km distant. Little known or visited it’s the deepest canyon in the world, plunging 3354m down to the Rio Cotohuasi, more than twice the depth of the Grand Canyon. We'll be posting more from Mike as he journeys through the Peruvian Andes. You can also follow his musings from the trail on his blog as well as read about some of other trips he has taken around the world. 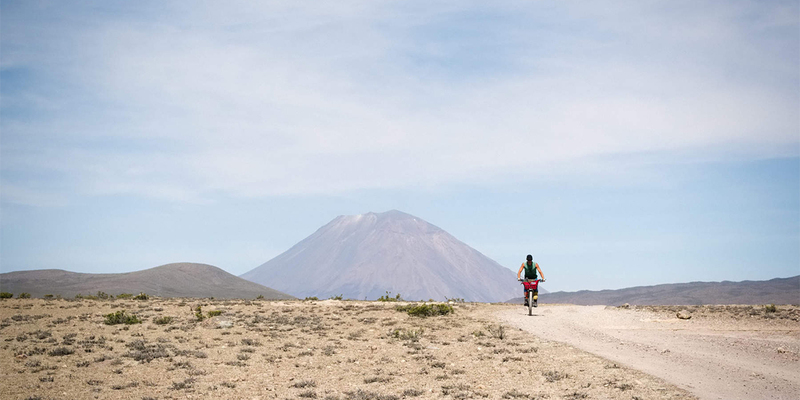 It is a long, hard climb out of Arequipa, gaining some 2000m in altitude around the flanks of Nevado Chachani (6057m) with fine views of Volcan El Misti (5822m). 14 years ago I met this chap as a result of riding through the remote mountains of Ladakh. I passed his tent in the half light of an early morning while slowly climbing to the summit of the Tanglang La. At 5,328 metres (17,480 ft) it remains the highest place I have ever ridden a bicycle, although there are passes ahead of me that will challenge that. We stayed in touch and occasionally are able to catch up for a few days, such as here in Southern Peru. A fantastic opportunity to enjoy some banter and compare notes on past adventures as we made our way skywards from Arequipa. This is primarily a dirt road journey. The Andes here are criss-crossed with inumerable tracks, many unmapped. Modern satellite imagery is a boon in finding routes to explore. Distances between communities are vast and camping is essential, as is the ability to be completely self-sufficient for days at a time. Conditions can be hard going. An image of a bitterly cold, gale-swept camping spot at 4500m. The sun is gone by 5.30pm and by 8pm everything is frozen solid. Somewhat befuddled with altitude and fatigue, I foolishly forgot to take my waterfilter into my sleeping bag with me one evening. The expansion of ice in its microscopic elements has rendered it useless but I should be okay – there is a lot UV in the light up here and little livestock above 4500m so mountain springs should be fine to drink untreated. Touring on dirt is hard work but so much more satisfying than sticking to paved roads. Vehicle traffic is almost entirely absent and it is possible to access far more remote areas. It's also just a lot of fun! This is the tiny pueblito of Sibayo. The roads here were blockaded by protesters and the remains of burning tyres. The area is paralyzed by strike action and protests against the extensive mining activities in the area that are stripping the landscape, destroying communities and exporting all the wealth far away from these rural places. A story that I’ve sadly experienced first hand all over South America. In Argentina, in particular, I saw much in the way of intimidation of villagers by 'employees' of the mining corporations and government agencies. The cloud came up the morning I rolled down the upper reaches of the Colca Canyon but I enjoyed fine views of the Sabancaya volcano along the way. Dormant for 200 years it woke up again back in December 2016. Alpacas are the product of domestication and are descended from the delicate and quite rare vicuña. Most are bred purely for their wool, however this little chap in the village of Tuti was so friendly that I suspect he is a family pet. Chivay. Towns and villages in Latin America are invariably colourful. I love the use of bright colours. Chivay. Really just a village. As with all towns in South America it has a lovely central plaza that, in this case, is surrounded by a small grid of quiet, dusty streets. It is a lovely spot.